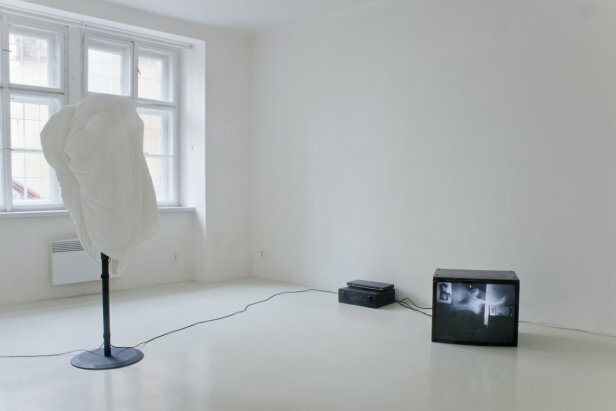 Although Aleš Čermák (*1984) has been moving about the art scene and publicly exhibiting for roughly six years now, it was only this year that he successfully completed his studies at Jiří Příhoda’s Studio for Monumental Works at Prague’s Academy of Fine Arts. His founding of the Ausdruck Books publishing house also relates directly to his work, for literature, reading and text are a fundamental means of expression for him; ones that he places in the gallery space. The publishing house then extends beyond this environment and community. 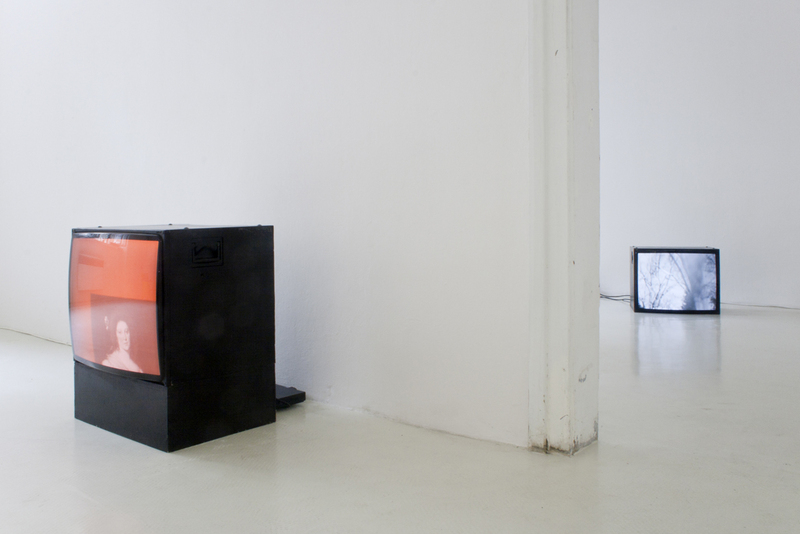 Some of his exhibitions are more construction, others build on recurring ideas. His work at the Fotograf Gallery has however its clear, yet not fully communicated, reading or message. The main characters are two women; thus bending the nature of the exhibition toward a „theatrical“ form, which is indicative for Aleš Čermák. In one documentary, the important American film director and theorist, choreographer, dancer and poet, Maya Deren, says that women’s time differs from men’s time. The male world is one of now, the female world is one of constant metamorphosis; it is not about what’s happening now, but rather about what will come after. The anticipated gender theme, woven into the pioneering work about two protagonists divided by three centuries, actually incorporates a construction into the exhibition (or correlations that accommodate its intention) – Maya Deren’s films are pioneering for many reasons, but the most important is her means of capturing the female body, women on film. The female does not take on the role of the passive object that the viewer looks at. On the contrary, she is in constant movement, which predetermines and dictates the flow of the movie and its rhythm. The film medium itself is dependent on this immanent movement. Then not just the exhibition‘s antique format and the name of Barbara Strozzi’s baroque composition, Heraclitus in Love, combine with the stoic physics. This is an obsessively female work by two women, whose energy was burning within the Baroque, male society of Hollywood directors of the 1940s. In different spots there is mention of their temperaments, expression, opinion, emotionalness and the scope of their production. In addition to May Deren’s films, which are the essence of her interest in dance and understanding movies as choreography (directing) of not only dancers, but also the entire situation – the space and all living and non-living things moving about it – one hears the composition of the greatest female composer of the 17th century, Italy’s Barbara Strozzi. Thus a very special connection of avant-garde visuality with Baroque composition takes place, which is not pure absurdity, also due to the fact that silence in Maya Deren’s silent movies is not technical but expressive. So the exhibition bears within itself not just connections, but also contradictions that shift its meaning from beauty to a problem. The Baroque celebration of the tragic feeling of the betrayed love of the philosopher, Heraclitus, overlaps an enthralling, psychoanalytical and iconoclastic study of the male dancer, whose successive movements carry the viewer to different environments through the flow of time; natural, intimate and museum milieus. 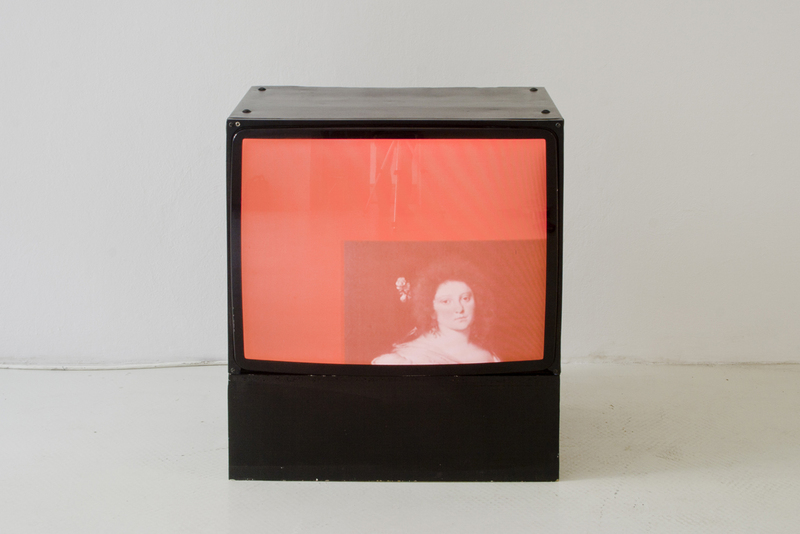 The emphatic ties to the global axes, the mobile sculpturality and the mythological transcript then become reverse connecting points to the audio plastic representing Barbara Strozzi. This joyous tribute to both artists is also to be found in the exposure of the author’s long-term interests, which explore the rationality of contemporary interpretations and look for other models and or allies in understanding the modern world. Combining the present media performance and reading with a future film and its preceding text mixes in an Aristotelian unit of a similar nature, i.e. the rotation of scenes from Maya Deren’s movies, the incorporated character of the dancer (in other films she herself at the narrator) and the bridging to a system of Baroque melodic passages. The ecstaticness of the Baroque and the tension in Maya Deren’s films, in which she joins the opposites of ritual wood and tai chi (control and release of oneself) into one dance piece full of tension, are the preservation of clarity and its blurring all at the same time. Through this image work for the Fotograf Gallery, Aleš Čermák builds on his previous creations, which are typified by clever, but not cold (impersonal), choreography that follows the layering of individual events in the sequence of time and in various executions. The cloaked events are not meant, however, to rehabilitate linearity, which is proven by a quoted passage from his latest book: When a dog runs after a bounding rabbit, it is clear that he has some overall idea of his future trajectory and that he predicts or anticipates it; thus his actions are not just a mere reflex. Through his reserve archaeology, use of materials from an endless archive of art, following the function of memory, empty and marked places, a glimpsing into visual poetry and avant-garde legacies, a need to connect written and read texts and descriptions with spatial and moving forms and audio-visual recordings, he consciously claims his spot among the previous generation of Czech artists such as Ján Mačuška, Jiří Skála and Zbynek Baladrán; but in this installation he also joins his much older female predecessors.